The steady rise of more burger joints means more options for us burger lovers. Top-notchers from across the globe joined other fast-food franchises and gourmet brands here in Manila to whet Filipinos' appetite for more tasty, comforting grubs, there's one from California, then from Canada and now from Hawaii. Teddy’s Bigger Burgers, Hawaii’s top burger joint, has opened it's hibiscus-tainted doors, to answer foodies plight for perfectly-made burgers. This I would consider as another monumental effort of bringing quality American comfort food in our malls and top food spots. With this, their first branch which debuted last August 23, 2014 at Greenbelt 3 was opened. And boy, you'll be surprised at how Filipinos really crave for burgers. As foodies from all walks of life lined up early, to be the very first 100 patron to indulge on huge burgers. So, what is Teddy's Bigger Burger all about? Burger lovers themselves, Ted Tsakiris and Rich Stula, have put up Teddy’s Bigger Burgers out of pure passion for getting their well-loved burgers out, since they could not find any really good burger joint in Hawaii, well probably not in any restaurant that serves the same quality burger they cooked in their backyards. Last, August 20, I was blessed to be one of the first people to have tried some of their burger offerings. The place speaks for itself, described as how they have set it up in other branches in different countries. Interestingly, since its inception in 1998, Teddy’s Bigger Burgers has opened in 11 locations in Hawaii, and recently on US mainland in Washington and Iowa, with stores soon to open in California and Texas. The Philippines marks Teddy’s 2nd international location, following Japan. When they said they reinvented the concept of burgers, the SIZES AND SPECIAL SAUCES matter. To even break down to the very details here is how they have described their burgers. Ground chuck is taken from the shoulder and neck portion of the cow, with prevalent meaty flavor and enough fat to ensure the beef does not dry out even when cooked on high temperature. “We use a formula of 80% lean meat and 20% fat. This is ideal for burgers because it does not need extenders but retains its shape. Most of all, it makes for a juicy patty,” adds Habawel. The patties have zero preservatives and are not injected with flavors. And because the patty is charbroiled, extra fat drips down instead of the patty swimming in grease. Burger sizes also set Teddy’s apart, with “Big,” “Bigger,” and “Biggest” patties. Teddy’s Original Burgers are topped with a signature ‘Special Sauce,’ the burger joint’s own sweet and tangy creation. Teddy’s Teri Burger meanwhile, is basted with a sweet teriyaki sauce – a traditional recipe made from scratch -- while the Western Burger is topped with barbecue sauce. All sandwiches come with crisp lettuce, tomatoes, pickles, and onions, but diners have the option to customize their burgers with a variety of toppings, including bacon, blue cheese, jalapeños, onion rings, and pastrami, among others. Because all burgers are made to order, customers can also opt to reduce or remove seasoning, and use lettuce instead of bread as buns. Nothing can complete their good burger without the golden in color potato buns, that are soft and delicate in texture, with a slightly sweet note that brings out the savory, smoky flavor of the burger. Teddy’s sides include extra crispy fries and tots with a variety of sauces (cheese and garlic butter), and beer-battered onion rings. What can best complement your burger? Milkshake! 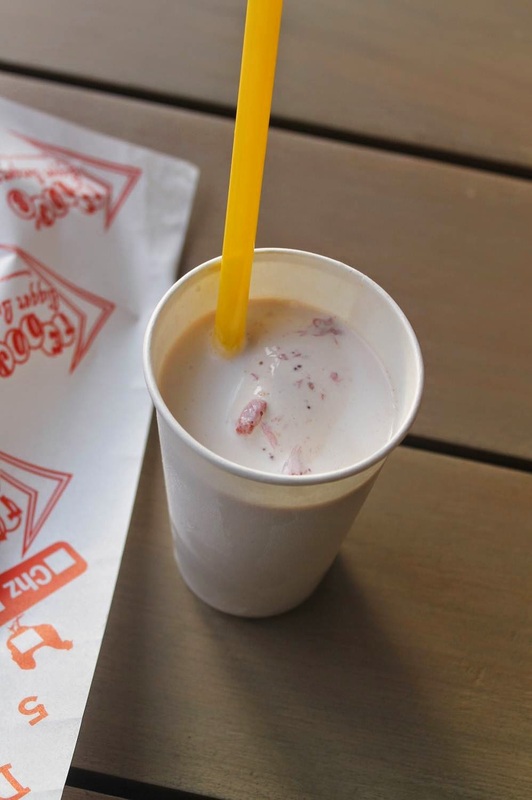 Teddy’s is also known for super thick milk shakes, in flavors such as chocolate, vanilla, and strawberry, peanut butter, rootbeer, dreamsicle or pineapple. The staff recommended two flavors to mix, and it was spot on! The photo above is a combination of strawberry and peanut butter. The shakes are 90% ice cream and 10% milk. Unlike other shakes that are watered down with ice, theirs have a very rich taste, feel good taste. Because of the locations for Teddy’s in the Philippines, the burger joint will soon be serving alcoholic beverages. “Hawaii doesn’t have alcoholic drinks on their menu, but since we’re opening in malls with restaurants that offer alcoholic beverages, we’ll be offering both imported and local beers as well as some cocktails that were crafted specifically for Teddy’s,” adds Habawel. From now until September 3, 2014, mall patrons at the Greenbelt Mall also have the chance to win a free burger from Teddy’s by taking a burger selfie with either the Teddy’s Bigger Burgers store board up or Teddy’s Bigger Burger standees around the mall. Participants must upload their photos on Facebook or Instagram account with the hashtag #teddysburgersph. The first 100 entries will win a free 5oz Teddy’s Original Burger. When you do, let me know how it fared to you:) But for sure, you will definitely love it as well. There are five meters Cheap Kate Spade Bags in diameter huge enough blood into the Kate Spade Outlet cocoon stand space.It exudes a fishy smell Cheap Kate Spade HoBo Bags of the blood cocoon, needless Kate Spade Outlet to Cheap Kate Spade Satchel Bags say definitely demon blood in them. Absolutely can not let Cheap Kate Spade Handbags Sale him get away. Of course, smell the stench of these shares smell, and he can be sure, because that just break the demon blood, which must Cheap Kate Spade Handbags be the flavor of its issue. Foot feijian speed away. Everyone heard, know that things tough, have to run to the extreme with the instruments used Cheap Kate Spade Handbags in the back.That's come here with the taste, can not help looking at the scenery Cheap Kate Spade Wallets look happy. Salivating right now with this post...omnomnom!